Python is an interpreted, object-oriented, high-level programming language and it is used in many different application areas, e.g. in scientific and numeric computing. 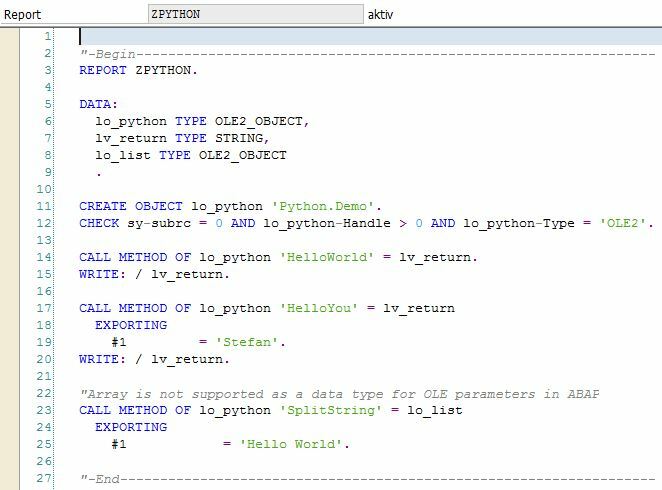 It can be very valuable and helpful to combine SAP ABAP with Python. In this blog I will describe a way to do that via the SAP GUI for Windows COM interface. Here I described how to combine ABAP with Python via an additional library. The entiry Python environment was part of a packed file which was stored as function module on the SAP application server. Here I described how to use Python as external OS command. Here now another way. The communication between Python and ABAP runs in this case via the COM interface. Python offers via Python for Win32 (pywin32) extensions the possibility to create COM server. With ABAP and the SAP GUI for Windows is it possible to connect these COM server and to use its functions. Download Python from here and install it. 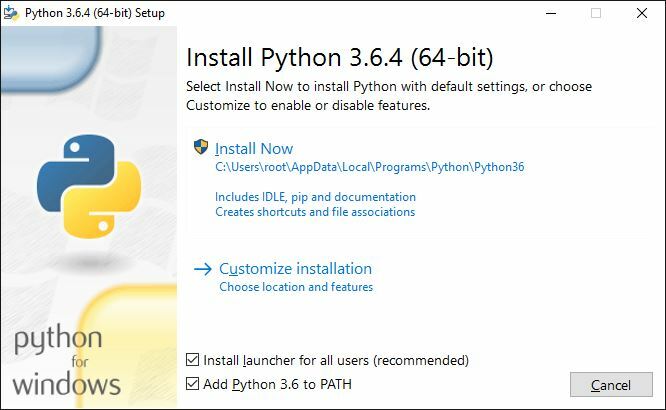 Download the Python for Windows (pywin32) Extensions from here and install it. Copy the following Python program to your computer. _reg_desc_ = "Python Demo COM Server"
return "Hello " + str(name) + " from Python"
• HelloWorld returns a string with the using Python version, platform system and architecture. • HelloYou returns a string with a parameter. • SplitString – the standard example from the help – delivers a list of single words of a string. Also the class contains different annotations for the COM registration. The main routine of the program contains the registration code. Register this Python program as COM server. Try the following VBScript to check if everything is okay. This VBScript call from the COM server Python.Demo, in this case the Python program, the different methods – HelloWorld, HelloYou and SplitString. Hint: It does not matter which version of VBScript you use – x86 or x64 – it works with both. Try the followin ABAP report. CHECK sy-subrc = 0 AND lo_python-Handle > 0 AND lo_python-Type = 'OLE2'. CALL METHOD OF lo_python 'HelloWorld' = lv_return. The ABAP report do exactly the same as the VBScript. Here the result of the ABAP report. Hint: It is not possible to use a COM method which delivers a variant from the type array. So it is not possible to use the method SplitString – SAP note 633105. At this point we see that is easy possible to use Python inside ABAP seamlessly via COM interface. We register the Python class as COM server and use it inside ABAP. A huge advantage is that you can change the Python class on the fly. This means you can add or change methods without a new registration. So you can develop and test your Python class independently from your ABAP code, but you can use each change immediately in your ABAP code. Hint: It could be possible that the security settings of your SAP GUI for Windows doesn’t allow to create an object as in my case. If it is so and you want to experiment with this approach, disable this settings temporary for the time of your experiment. And don’t forget to enable it after your experiment. this makes no difference, it works also with Python 3.7.x. 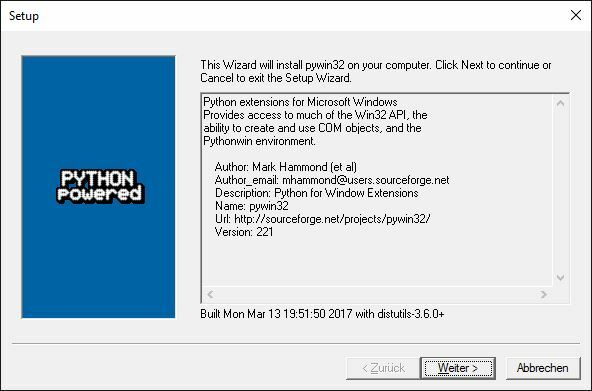 Do you installed PyWin32 successfully? I have created COM Server using given python code and registered in SAP application server OS and restarted system and server. But on execution the given ABAP program, it’s giving SY-SUBRC = 3 error code. Is there anything I am missing in OS or SAP side. sy-subrc 3 means problems with memory allocation at the presentation server. I don’t know what could be the reasons. There was some mistake while registering COM server. Now I have successfully registered COM server. And it’s working fine in VBScript code. But getting SY-SUBRC = 2 error code on abap side and OLD HANDLE is giving -1 value. Do we need to maintain Python.demo entry in SOLE t-code, if yes, please share the configuration information. do you disable for your test the security settings as I described in my hint?